Along with saving money and making a budget for your travels, you also have to think about how you’re going to access your cash and pay for things on the road. Different countries handle money different ways, and where you’re traveling will impact how you should best access your resources. For example, in the U.S. people pay for everything by credit card, but in Southeast Asia cash is king. You often can’t pay for things with a credit card, including tickets and even accommodation. Living in Thailand, I never use my credit card unless I’m making an online purchase. Never. This means that I need to regularly use an ATM machine to take out money from my U.S. account. Any fees associated with the transaction, both from the ATM machine and my home bank, quickly add up – especially considering I’m in an area where $1 can buy a full meal. Since I rely on my ATM card, I need something that doesn’t charge ridiculous international fees. While I don’t use my credit card as often it’s less of an issue, but I still don’t want to pay for extra fees if it’s not necessary! 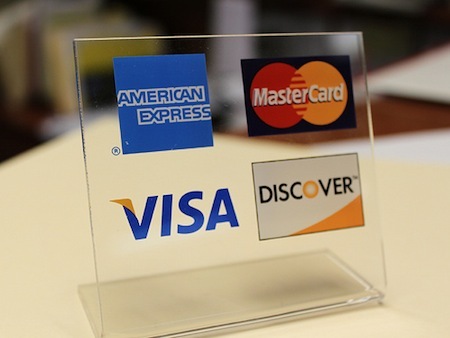 For U.S. citizens there are two credit and ATM cards that are repeatedly recommended by long term travelers and travel bloggers because they charge NO FEES. None. Ever. If you’re going to be traveling for an extended period of time they’re well worth looking into to save you money. The VentureOne Rewards credit card from Capital One doesn’t charge any international (or domestic for that matter) transaction fees and lets you earn 1.25 miles per dollar on every purchase to use toward flights, hotels and more. There also aren’t any sign up fees or yearly costs. The ATM card that comes with a Charles Schwab High Yield account doesn’t charge an international processing fee to use and it refunds all fees charged by whichever bank/ATM machine you use. This means you can use it absolutely anywhere, anytime, as often as you want without being charged transaction fees. Do you use either of these cards while you’re traveling? Have any other tips about handling credit and ATM cards on the road? Let us know in the comments below!